We inherited this rhubarb patch when we bought our home ten years ago. It's right next to our vegetable garden. Right now there are five rhubarb plants marching in a row with their fresh, crinkly, light green leaves and celery-like stalks sprouting from the earth. If you've never grown rhubarb and you'd like to start here are some facts, tips, and links to get you going. Rhubarb is a cool weather plant and can tolerate severe winters. It's a perennial so once it takes hold, you'll have it forever! Well, okay, "forever" is probably a stretch. You'll have it for 10 to 20 years which, depending on how old you are, could be considered forever! Your rhubarb patch has to have a minimum of two months of cold weather and it likes to have its roots frozen 2" or 3" down. Obviously, rhubarb will not grow in hot, dry climates. There are five varieties of rhubarb (that I know of). "Victoria" is the standard large green variety but I think you can get a red Victoria, as well. "Ruby", "Cherry", "Valentine" and "Giant Cherry" are red. The Cherry & Giant Cherry grow the best in climates with milder winters (like California). Valentine is the variety that is the most disease resistant. Rhubarb will thrive beautifully if it's planted in full sun but is tolerant enough to grow in shady areas as well. It's extremely disease resistant and usually pest-free. The leaves of the rhubarb plant are toxic so be sure that children and pets don't try to eat them. (Well, don't let adults eat them, either!) It's probably a good idea to surround your rhubarb patch with a fence if you have small children or pets. The All-Recipes website cautions that: "After a freeze, the oxalic acid that can make the rhubarb leaves poisonous may migrate to the stems. Dispose of mushy stems or those that appear to have frost damage. If in doubt, throw them into your compost bin (it's safe to do this)." Rhubarb is also called the Pie Plant (duh). An excellent source of calcium, fiber and vitamin C.
Rhubarb grows wild in China and Tibet. Rhubarb is actually a vegetable. Rhubarb can be substituted for up to half the fruit in a recipe. One pound of Rhubarb will make about 3 cups chopped. Rhubarb reaches its peak between April and June. Rhubarb is known to have mild laxative properties. You can buy rhubarb seeds but it's important to note that gardeners rarely grow rhubarb from seed. It takes a long time to get a mature plant from seeds and it's really more trouble than it's worth. 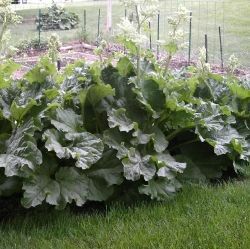 In cool climates like ours in the upper midwest, you should plant the rhubarb "crowns" (root divisions) in early spring as soon as you can work the soil. If you live in a milder climate, it's better to set the plants in the ground in the fall. * A sunny location is necessary for red stalked rhubarb or it'll stay green. The soil should be well-drained. 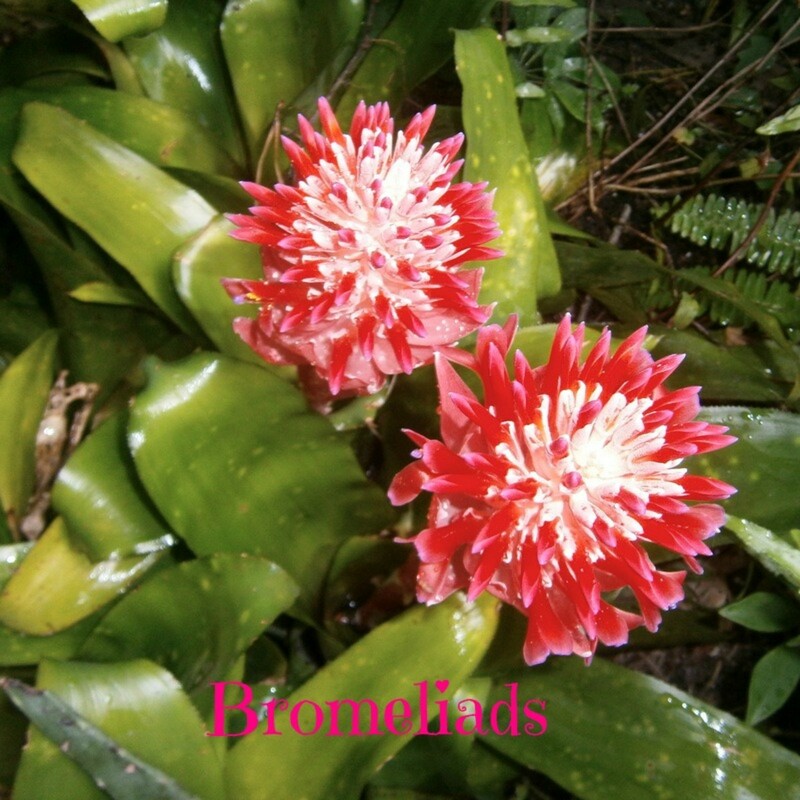 * It's best to plant it in an out-of-the-way location because some varieties grow quite large. You don't want to crowd out your other vegetables or flowers. * Also, rhubarb produces large thick roots which need lots of room. So choose a spot where you won't have to move it. * Dig a deep hole about 2 or 3 feet wide and mix the soil that you remove with compost. Refill the hole within 2" of the top in a mound shape and place the roots of the crown so they spread over the mound. Cover with soil, firm it down and water well. * After the ground warms up and the plants sprout add some mulch to help retain moisture in the soil and discourage weeds. You can also use grass clippings or leaves. The first year or so you can add compost a couple of times during the summer. In the fall, cover again with a mulch of some sort. * The plants will send up tall stalks in mid-summer which should be cut off down near the bottom of the plant before they flower. This will help produce more stalks and leaves. I'll admit that I don't always do this and my rhubarb is still good and plentiful. I probably have two dozen gardening books. Here are two of my favorites. Plant this sweet variety from Nature Hills Nursery. NOTE: You can order any time and the young plants will be shipped in time for your growing season!! Order before they're out of stock. The Chipmans Canada Red Rhubarb, Rheum 'Chipmans Canada Red', is one of the sweetest of the red rhubarbs with bright red stems that are delicious for sauces and pies. Be sure to pull the stems loose, don't cut them off. This perennial should be mulched deeply with manure each fall. Rhubarb thrives in cool locations and full sun, but in warmer climates, plants benefit from light shade but form longer, thinner stems. Rhubarb needs deep, moist but well-drained soil, and is generally trouble-free. Slow growth of older plants is a signal that they need dividing. This rhubarb does harvest well in fall and seldom goes to seed. This attractive perennial plants will accent your landscape and remain productive for decades. According to Louise Riotte in her wonderful gardeining book Carrots Love Tomatoes, planting columbines next to rhubarb helps protect them against red spider. The Columbine 'Denver Gold', Aquilegia chrysantha, has large, very showy, yellow flowers that can measure over 3" across. The fragrant flowers reflect the sunshine of their Rocky Mountain home. 'Denver Gold' blooms in late spring, and if deadheaded, will be a heavy reblommer. With a spread of 15-20" and height of 24-30", you won't want to miss this. 'Denver Gold' should be planted in full sun to partial shade in fertile, moist well-drained soil. Columbine is a profuse self-seeder so it should be planted 12-18" apart. It is best used in rock gardens or in containers and for beds and borders, in cottage gardens and it attracts butterflies. 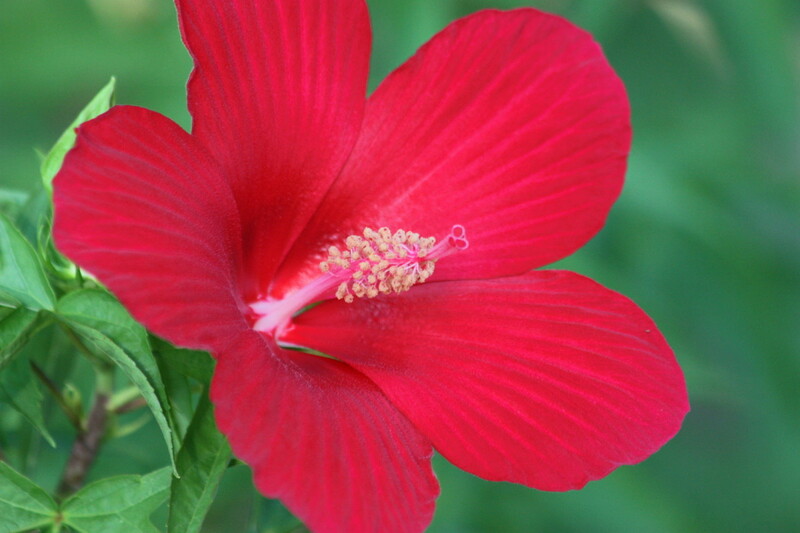 Enjoy this popular flower in your garden or as a cut flower. Rhubarb Art - Yep, rhubarb as art - Who'd have thunk it?? These really are lovely pieces of art all celebrating the humble rhubarb plant. A most unique collection. Spring is a fresh fruit season, for sure. Whether fresh out of the garden or turned into something delicious, everyone likes fruit one way or the other. I think. Vote on your favorite spring fruit. What's your favorite spring fruit? Just plain old rhubarb - fixed any way at all. The correct way to harvest rhubarb is to reach down to the base of the stalk and pull with a slight twisting motion. It'll come out nice and clean. Don't harvest any stalks the first year; just remember to cut the flower stalks back. The second year it's best if you just harvest a few - 2 to 4 stalks per plant - and be sure they're about 1" thick. The third year you can pick stalks for 1 to 2 months and after that pull as many as you like! Flickr Photo courtesy of low. Because the rhubarb season is relatively short, it's a good idea to freeze the rhubarb that you're not going to be able to use right away. How yummy to pull out a package of frozen rhubarb in the middle of winter and serve up a springtime treat! Chop into 1/2-inch pieces, spread them on a sheet pan and place in the freezer. Once frozen, slide the rhubarb into heavy-duty plastic freezer bags. Seal tightly and put back into the freezer. Packed this way, rhubarb will keep for up to six months, and can be measured from the freezer bag. Choose firm, tender, well-colored stalks with good flavor and few fibers. Wash, trim and cut into 1- or 2-inch pieces or in lengths to fit the package. Heat rhubarb in boiling water for 1 minute and cool promptly in cold water to help retain color and flavor. Drain. Pack either raw or preheated rhubarb tightly in containers without sugar. Leave head space, seal and freeze. Pack either raw or preheated rhubarb tightly into containers, cover with 40 percent syrup. Leave head space, seal and freeze. Mix either raw or preheated rhubarb with 12 cup sugar per quart of prepared fruit. Pack into containers, seal and freeze. Here's a delicious collection of rhubarb related products...for yourself as a unique gift for another lover of rhubarb! Pre de Provence Rhubarb Soap, 250g wrapped bar. Imported from France. With shea butter and natural herbs and scents. @anonymous: I'd love your recipe for rhubarb ade! Sounds delish! @anonymous: Oh dear...sorry I'm so late in responding to you. 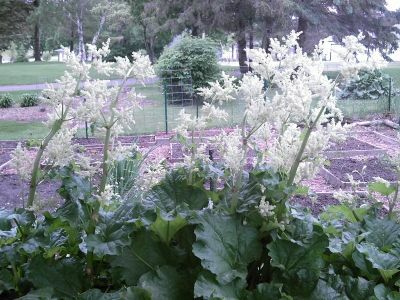 By white rhubarb plant, do you mean white flowers? @julieannbrady: Hmmmm...certainly worth thinking about, Julie! Thanks for the suggestion. I have never created an ebook so learning about that would have to come first! Ah, my dear ... have you contemplated your ebook on rhubarb? I think "The Rhubarb Patch" would make a great title! I accidentally killed my dads rhubarb plant! I'm trying to find a white rhubarb plant can anyone help. Please. This is a really great lens. My wife (Ramkitten) and I used to have a big rhubarb patch when we lived on a farm and grew most of our own food. At first, we didn't know what to do with it, but eventually we were making all sorts of rhubarb recipes, even "rhubarb ade," which was our version of lemonade ... only with, well, rhubarb instead of lemons. It was a big hit at the Farmers Market, where we gave away free samples. I planted one rhubarb plant when we moved into this house 8 years ago. I should have planted more! I got 3 pies out of it this past spring. Maybe more next year. Blessed! Hi Deb, Thanks for visitng! You've asked if it's okay to harvest rhubarb in September and October. It depends on where you live, actually. If you live in Minnesota (like I do) you can harvest from May through September. If it has been a hot summer with little rain, the stalks might be more fiberous and woody and might not taste as good. Also, if there has been a frost, you should be cautious because the oxalic acid in the leaves could migrate to the stems and that would make them toxic. is it ok to harvest rhubarb im Sept/Oct ? i've always wanted to grow rhubarb; maybe this year! We too inherited a rhubarb patch when we became caretakers of a Pennsylvania farm for a number of years. I'd heard of rhubarb but never really knew anything about it or what to do with. By the time we left the farm six years later, I think we'd tried just about every recipe rhubarb could fit into. (Or lots of them, anyway.) We even made rhubarb-ade, like lemonade but ... not. It really is such a pretty plant, though, even if you don't eat the vegetable. I never realized rhubarb was such a pretty plant when in bloom. I just wish rhubard was a little more sweet so I wouldn't have to have so much sugar in my recipes. This is exactly what I was looking for - I am learning about growing vegetables for my own home project. Love rhubarb, love strawberries, never understood why anyone would combine them! There's rhubarb in my parent's yard that was grown by my grandfather. He's been gone almost 40 years, but the rhubarb comes back every year whether we pick it or not. What a wonderful treat, it's one of the many things at my parent's house that keeps the memory of my grandfather alive. As a child, rubarb crisp and ice cream was one of my favorite treats. Rubarb doesn't grow well here in the south. Its too hot. I miss it. Great Lens. My Parents had a rhubarb patch in their yard too. A neighbor used to always make pie from it! Wonderful lens my husband grew up with rhubard he would dip it in sugar and eat it ! This great lens is now being featured at the Cabaret Squidoo blog! Please add it to the Cabaret Squidoo group. That settles it. I grew up with a rhubarb patch in the yard, and I miss it. I'm going to find a spot in my yard I can prepare for them and put in some rhubarb next spring. Thanks for inspiring me, I'm glad I saw your SquidCast!! That's a wonderful story, GramaBarb. Don't you just love those memories...thanks for sharing it! Do you have time for a short rhubard plant story? My grandmother (back in the early 1920s in BC, Canada) ordered rhubarb seed from a seed mail order nursery in Winipeg Canada. She carefully nutured the plants until they produced beautiful red Canadian rhubarb stalk! Whenever my Grandmother moved she took her precious rhubarb plant with her. When my Grandmother passed away then my Aunt became the caregiver of this special rhubarb plant which is still growing in the interior or BC, Canada. I will enjoy it's fruit soon when I visit my Aunt. Another great lens in the series. Very helpful too!